Special invitees and delegates at the opening of the PNC-Reform’s 19th Biennial Delegates Congress. President David Granger on Friday warned those spouting racially divisive utterances, in clear reference to recent controversial claims of racial discrimination against East Indo-Guyanese by Opposition Leader, Bharrat Jagdeo. “We can still see how easily it is for the ranting of a few persons to rekindle racial animosity, a retrograde step which has no place in modern society,” the PNCR Leader told the opening of his party’s 19th Biennial Delegates Conference. Crying “shame” on such persons, Granger said his party was “alarmed at the vocal efforts by a few persons to promote social division.” “We want to warn that such inflammatory tirades run the risk of degenerating into social instability, degenerating into the fostering of distrust, into the fomenting of disorder,” said the President. Granger, whose administration has been forging ahead with a policy of social cohesion to build bridges across the racially divided political landscape, informed that such utterances have caused grave instability in other countries. “There is no place for such language in Guyana and in the Diaspora,” he said. “Comrades, we need to exhibit the spirit of social cohesion. Social Cohesion is about combating exclusion and marginalization,” he said. Back in September, 2015 at the opening of a Social Cohesion Round-table, the President warned that government would enforce existing laws against racism more vigorously and vigilantly guard against bad elements who foment social and racial strife. Jagdeo has charged locally and in Queens, New York that the Granger-led coalition government has been discriminating against Indo-Guyanese and Amerindian and Afro-Guyanese who are PPP supporters. 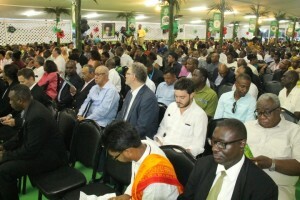 Reacting to government’s condemnation, Jagdeo has counter-charged that, by the government’s logic, Granger and other then opposition activists had been equally racist when they had charged that the then People’s Progressive Party –Civic (PPPC) – led administration had been discriminating against Afro-Guyanese. The PPPC has refused to participate in government’s social cohesion activities on the basis that it first wants the now 15-month old government to address its concerns that Indo-Guyanese, Afro-Guyanese PPP supporters and Amerindians are being discriminated against.